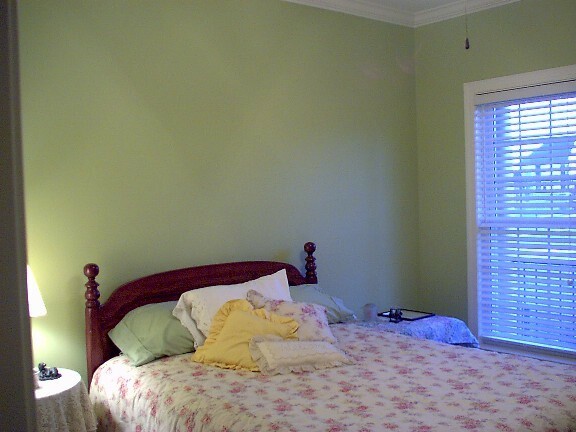 Ann paints the Guest Bedroom! 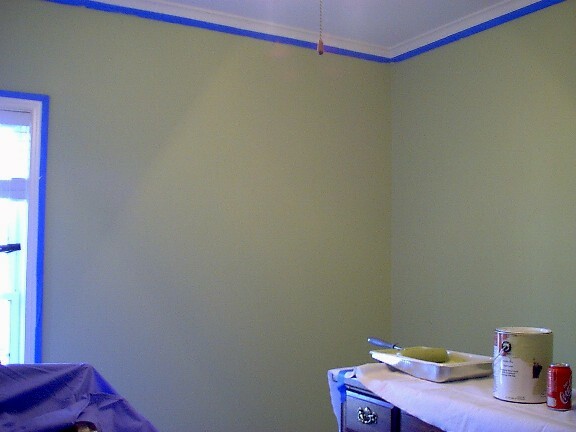 Yes, during my paid time off between the Time Domain job and the new job at Utility Automation I got the bright idea to paint the guest bedroom. Well, actually it started last Friday when I made the mistake of going into Linens 'n' Things unsupervised... LOL. I came out with some new Egyptian cotton sheets in a gorgeous mint green and a duvet cover to put over the comforter in the guest bedroom. 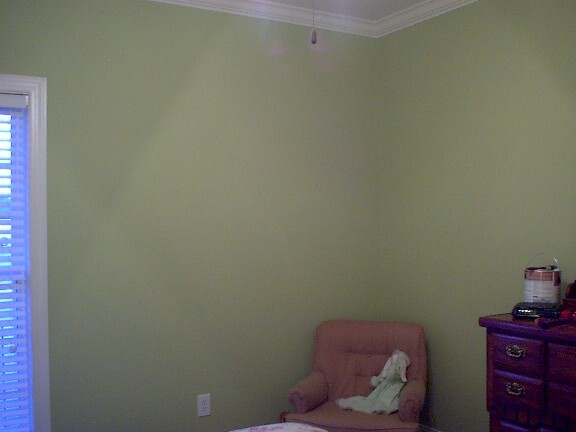 They looked so good in the room but something was missing... yes, folks, the pinky tan of the walls just had to go! 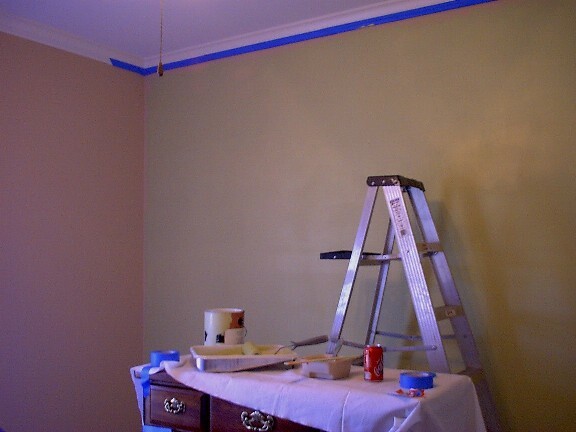 So, after going to Home Depot to get 5 brochures on paint samples, Rich and I finally decided on a color -- "Brighton Pavilion" by Behr. 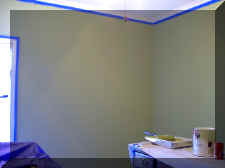 Why it's called that I don't know - it looks like a "spring green" to me. Oh well. 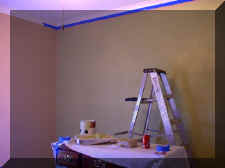 Paint job started Wednesday afternoon and I finished late this afternoon. Still deciding on what exactly to hang on the walls in there but thought you'd like to see most of the finished product. 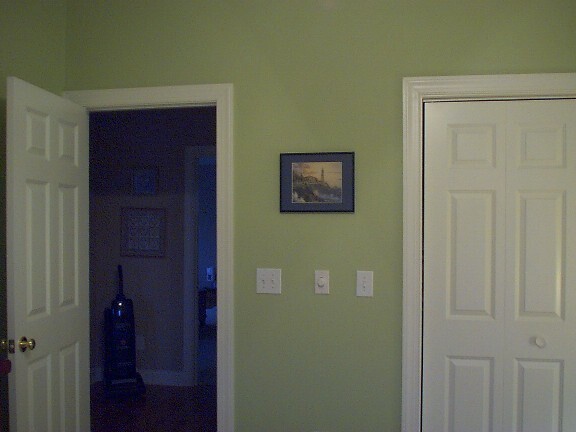 Okay, the color is REALLY off here but it's a last look at the pinky tan wall (on the left) and a first view of the spring green wall on the right. 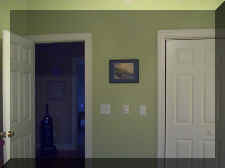 A better view of the color except near the window. This was after the first coat late on Wednesday. And, the room is back together! See, the pretty duvet cover? 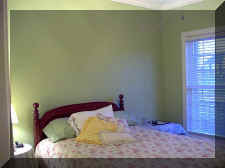 ;-) The walls match the sheets perfectly (which only the women will understand). And, I improvised and found a Kinkade calendar page that would fit in this frame and I think it's appropriately called "Calming Storms"
Just a last look at it. Rich just nodded his head.